artist, musician, guitar builder, housewife, parent, not necessarily in that order, or any order at all, for that matter. genderless being trapped in a trans woman's body. Fourth in the series of railroad themed guitars for Rail Yard Studios, made from a couple types of mahogany-like timber salvaged from the decking of decommissioned railroad cars. Another double-cutaway model, with chambered body and arched top, displaying the original tongue and groove joints along the edges, this one with a distressed milk paint finish on the body. The tailpiece and pickguard are made from an iron strap hinge, and the control plate from a tin utility pole sign. The New York Central emblem is an antique cereal box prize. Hipshot classic tuners, handmade brass fixed intonation bridge, two homespun humbucking pickups. Third in the series of railroad themed guitars for Rail Yard Studios, made from a couple types of mahogany-like timber salvaged from the decking of decommissioned railroad cars. One of two double-cutaway models, with chambered bodies and arched tops, displaying the original tongue and groove joints along the edges. This one features a pickguard made from a stainless steel builders plate from the running gear of a diesel locomotive. Last photo shows the Timken roller bearing serial plate I forgot to add. Brass compensated tailpiece, Hipshot tuners. Another one I decided needed some more visual interest. Body is sassafras, chambered, with chalk paint over milk paint, and distressed. Control plates are antique door hardware. Pickguard is cut from the face plate of a produce scale. Pickups are my homespun humbuckers, bridge: 8kohms dcr, neck: 7.1kohms dcr. Second in the series of guitars for Rail Yard Studios. The top on this one is pine bead board with its original green paint, salvaged from the doors of the old railroad freight station in Watertown, Tennessee. The rest of the wood is salvaged from the decking of decommissioned railroad cars. Control plates are antique door hardware, pickguard is rusted roof tin, and the tailpiece is an antique cast iron drawer pull. Kluson USA tuneomatic bridge, Hipshot tuners, two homespun humbucking pickups. This is the first of a series of guitars in collaboration with Rail Yard Studios, made from a couple different species of mahogany-like timber salvaged from the decking of rail cars built to carry coils of steel. Single cutaway model, with milk paint finish. Pickguard is made from an antique clock pan, and control plate from a brass machine plate. Kluson USA bridge plate, Hipshot tuners, 2 homespun single coil pickups. This is one I got bored with and decided to get a little psychedelic with. I made it three years ago, and it looked like this…. 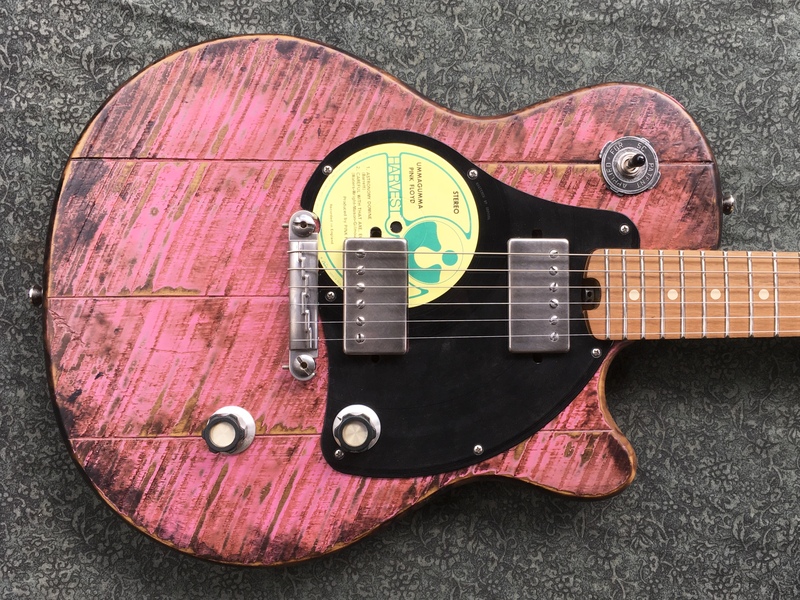 So I painted the top pink, and added some more grunginess, but then the pickguard didn’t go with it so well, and so I made a new one for it. Don’t worry, I only use records that have become more or less unplayable. This one was also missing the second disk of the album. I also aged the bridge and pickup covers, and made a new switch plate from an old die-cast metal 45 rpm adapter. Oh, and some vintage Heathkit audio knobs so the controls can be set to the heart of the sun, of course. Another Salamander, this one with a yellow poplar top with a gouged surface, on a buckeye back with a hammered and antiqued finish. Neck is walnut, with an osage orange fretboard. .82″ thick at 1st fret, .93″ at 12th. 1.68″ nut width. Pickups are homespun humbuckers with alnico 5 polepieces, in aluminum casings. Brass compensated bridge/tailpiece combo and Hipshot classic tuners.